Kwak Young-sook recalls when she and her husband, Park No-il, protested against Japan's World War II atrocities in front of the Japanese Embassy in central Seoul in 1974 with other members of the Korean Liberation Association and their families. The song used to be loved by ``kwangbokkun,'' an army of Korean volunteers organized in China in 1940 to fight for the liberation of Korea from Japanese colonial rule. Since then, Kwak and her husband went to every corner of the country to collect the army songs and write them down to music. She collected the songs as a way to restore the country's forgotten history. ``I was totally shocked. No one could remember the entire song. I thought I must do something about it," Kwak said in an interview with The Korea Times. ``I strongly believe that restoring the army songs is restoring the nation's spirit and our history," she added. In 1974, Kwak and Park took the first step toward the revival of the songs by setting up the ``Tongnipkunga Pojonhoi," the association of preservation of the independent army songs (www. www.doklipkunga.co.kr). Tracing the forgotten memory, however, wasn't easy. Most of the veterans' memories about the songs were dim and they mumbled the songs rather than singing them. ``You cannot call what they sang songs. It was just mumbling without a clear melody," the 82-year-old said. Even if she managed to record them and write them down to music, the tunes and the lyrics with the same title were sometimes different. ``The army songs were sung by soldiers across disparate areas in Manchuria and were taught to others in an oral tradition. That's why the contents are somewhat different, even if they are the same songs," she explained. After a painstaking process, she saw her efforts rewarded in 1975, releasing the first long-playing record (LP) of kwangbokkun army songs. ``I was so happy to see the LP. Although only six songs were recorded, it was meaningful because it was our first tangible result,'' she said with smile. Her joy, however, didn't last long. The next year, her husband, also one of the kwangbokkun members during Japanese colonial time, passed away of a heart attack at the age of 54. Nevertheless, she didn't stop the project. It took almost a decade to publish the kwangbokkun army songs in a music book. With a total of 192 songs, the first book, titled ``An Echo of Independence," was published in 1982. 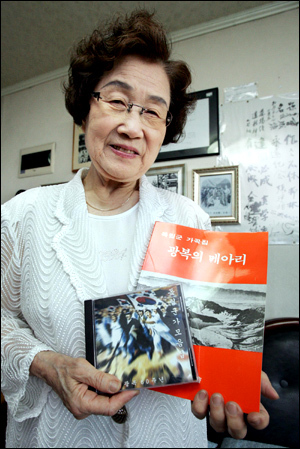 ``Half of the songs were sung by the kwangbokkun in Manchuria and the rest of them were shared by other independent fighters on the Korean Peninsula," she said. Not satisfied with just publishing a music book, she set another goal _ listing the songs in a school music book. Since 1982, she had persuaded many related organizations, such as the Ministry of Education and the presidential office, to list some of the songs. But she did not receive a reply until 1996. And in 1997, one of the army songs, ``Apuro Haengjingok (Marching Song)," was included in an elementary school music book for the first time. ``I could not express how happy I was upon hearing the news. It is a great achievement," she said. Followed by that achievement, another song, `` The Marching Song of Amnok River," was also listed in another music book in 2003. She also made a 1,000-army song CD this May and distributed them to organizations and individuals for free. ``I am pretty old now and not sure how long I will live. But before I die, I would like to see more army songs listed in school music books. That's my last wish," she finally said. 곽영숙씨는 그녀와 그녀의 남편 박노일씨가 1974년 광복회원과 그 동료들이 서울 한복판 일본대사관 앞에서 일본의 2차 세계대전 악행에 항거해서 저항했던 때를 다시 상기한다. 그 노래는 일제식민 통치로부터 한국의 자유를 위해 싸운 1940년 중국에서 조직된 한국광복군에 의해 즐겨 불러지던 노래였다. 그 이후부터 곽씨와 그녀의 남편은 지방곳곳을 다니며 노래들을 모으고 악보를 수집했다. 그녀는 그 노래들을 나라의 잃어버린 역사를 되찾는 방법으로 수집하였다. “나는 그때 정말 놀랐어요. 아무도 노래전체를 기억하지 못했어요. 나는 그것들에 대해 뭔가 해야겠다고 생각했지요.” 곽씨는 코리아 타임즈와의 인터뷰에서 말했다. “나는 군가를 복원하는 것이 나라의 정신과 우리의 역사를 복원하는 것이라고 굳게 믿어요.” 그녀는 덧붙였다. 1974년 곽씨와 박씨는 ‘독립군가 보존회’를 조직함으로써 노래들을 다시 살리기 위한 첫발걸음을 내딛었다. 그러나 잊혀진 기억들을 다시 살리는 것은 쉽지가 않았다. 대부분의 군인들의 노래에 대한 기억은 희미해졌고 그들은 노래한다기 보다는 입으로 중얼거리는 정도였다. “그들이 노래한 걸 부를 수는 없을 거에요. 정확한 멜로디가 없이 그저 중얼거리는 정도였죠.” 82세人은 말했다. 그녀가 노래들을 녹음하고 받아써 내려가고 관리했을 때조차도 같은 제목의 노래가 음정과 멜로디가 가끔 달랐다. “독립군가들이 만주지역의 전혀 다른 곳에서 불려지고 또 구전으로 다른 사람들에게 가르쳐졌어요.” 그것이 바로 같은 노래임에도 내용이 종종 전혀 다른 노래가 될 수 있었던 이유지요.” 그녀는 설명했다. 힘든 과정 후에 그녀는 1975년 첫 번째 광복군가 LP를 출반함으로 그 노력을 보상받는다. “LP를 냈을 때 너무 행복했죠. 비록 6곡만 수록되었지만 그것은 매우 의미 있었어요. 왜냐하면 첫 번째 실제적인 결과였으니까요.” 그녀는 미소를 띠며 말했다. 그러나 그녀의 기쁨은 오래가지 않았다. 그 다음해에 역시 일제시대 때 광복군이었던 그녀의 남편이 54세 나이로 심장마비로 돌아가신 것이다. 그럼에도 불구하고 그녀는 이 과제를 멈출 수가 없었다. 광복 군가들을 책으로 출판하는 데는 거의 10년이 걸렸다. 192곡을 수록한 ‘광복의 메아리’라는 제목의 첫 번째 책이 1982년에 출판되었다. “절반의 노래들은 광복군에 의해서 만주에서 불리웠고, 나머지 반은 우리 한반도의 독립투사들과 공유했죠.” 그녀는 말했다. 그녀는 단지 책 출판에 만족하지 않고 학교음악 교과서에 이 곡들을 수록하는 결과를 성취했다. 1982년 이래로 그녀는 곡들의 일부를 교과서에 수록하기위해 교육부장관과 관련기관들을 설득했다. 그러나 1996년까지 받아들여지지 않았다. 그리고 1997년에 ‘앞으로 갓’이 처음으로 초등학교 교과서에 수록되었다. “나는 그 소식을 듣고 얼마나 기쁜지 표현할 수가 없었어요. 굉장한 성과죠.” 그녀는 말했다. 그 성과에 뒤이어 다른 곡 ‘압록강행진곡’ 또한 2003년에 다른 교과서에 실렸다. 그녀는 또한 이번 5월에 독립군가 CD를 만들었다. 그리고 그것들을 기관들과 개인이 소장하게 하는데 공헌하였다. 곽영숙씨는 첫번째 광복군 가곡집과 광복군가 CD 광복의 메아리를 그녀의 경기도 일산 집에서 보여주었다.